- Make sure the character selection window remains open when pressing <Backspace> (and generally remains open for selection when it should). The iBus integration is still an issue. Expected to see a character selection window, but the selection window disappeared. 4. continue to test. press"back space", the character selection window appeared. press "back space" one more time, the character selection window disappeared again. It looks like it has to do with preediting and how it handles the cursor. When you start typing in preedit and then press the left arrow; the ibus pop up window disappears along with the text. When this happens and "IMTextEntry::UpdateCursorLocation()" gets called from "IMTextEntry::OnPreeditChanged" It is setting 1049949 on the y axis as opposed to 18, where it usually hovers on my machine. It then sets "gtk_im_context_set_cursor_location" with that y axis and this moves the popup off screen where it thinks the cursor's location is. Normally it does this when it thinks you have deleted all the preedit. It is getting the info from "GetCursorRects" so there must be something getting set incorrectly. It seems like the cursor is not getting set correctly or the text location it self. There seems to be a reason it is getting that ridiculously number for y when it shouldn't. I'll have more time tomorrow to look for that reason. Expected to see a character "提", but it is disappeared. 4. continue to test. press"down"key, the screen should show a character selection window, but nothing happen. The problem is located in "preedit_cursor_" and how nux uses it. There are also a few other things nux has for dealing with preedit which seems to be in the right direction. Such as "_preedit" which nux uses to store the preedit text in, also an attribute variable for the function "gtk_im_context_get_preedit_string ()". Hopefully I'll fix this soon! Example of the new preedit working. 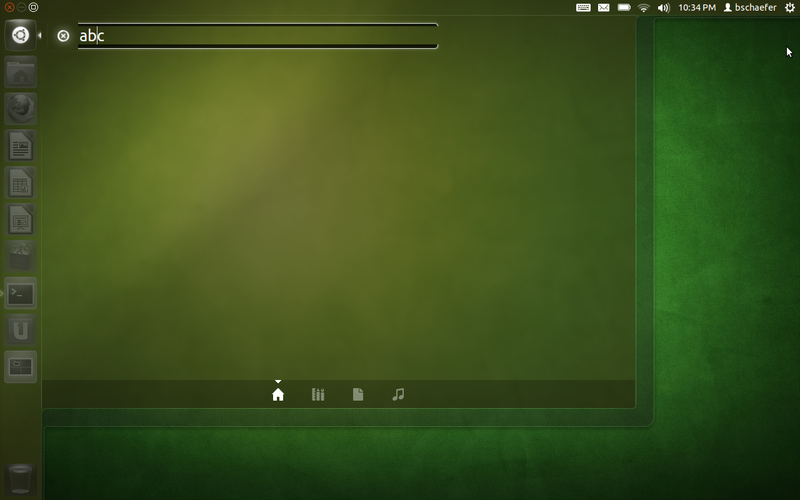 The window no long disappears when deleting or moving the cursor. Retest it today after several updates. 4. press "down" key in order to select characters, but it is stuck on the 2nd one. Expected to move the selection from 1 to 5 choices, then to the next pages. 4. continue to test. press"backspace", the character selection window works. 1. Type "wen" in search menu, the character selection windows appeared, but disappeared when I press"left" key two times. 2. Type "jia" in search menu, the character selection windows appeared, and worked when I press"left" key two times. Thank you for the testing. I just submitted a fix for the down key issue. 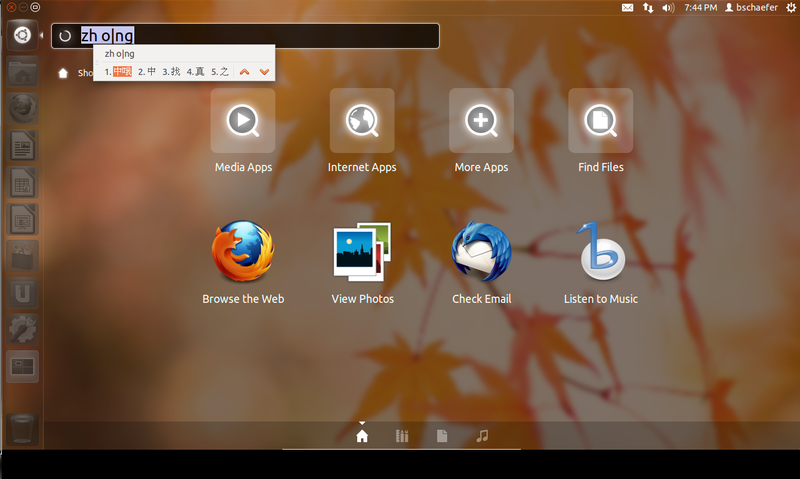 The window is not disappearing for me; so I'll see if I can reproduce this. 3. 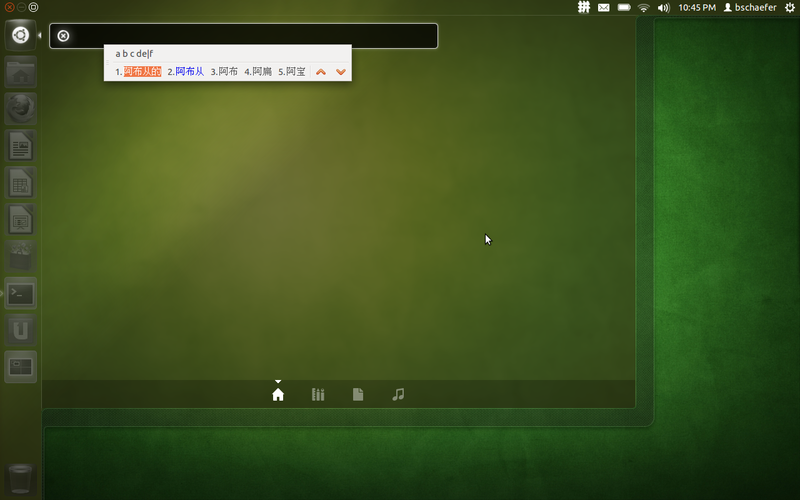 Type "zhong" in search menu, and a Chinese characters appears on the dash and character selection window appears either. I will verify it after SRU released. 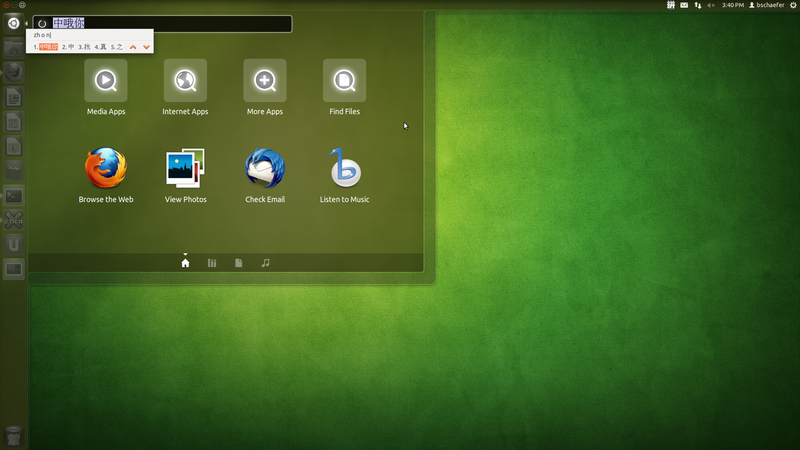 Accepted unity into oneiric-proposed, the package will build now and be available in a few hours. Please test and give feedback here. See https://wiki.ubuntu.com/Testing/EnableProposed for documentation how to enable and use -proposed. Thank you in advance! The proposed version works as expected. 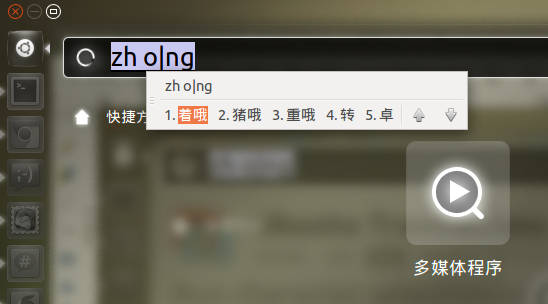 I typed zhong into the search box, I saw the selection window and it remained open after pressing backspace once or several times. 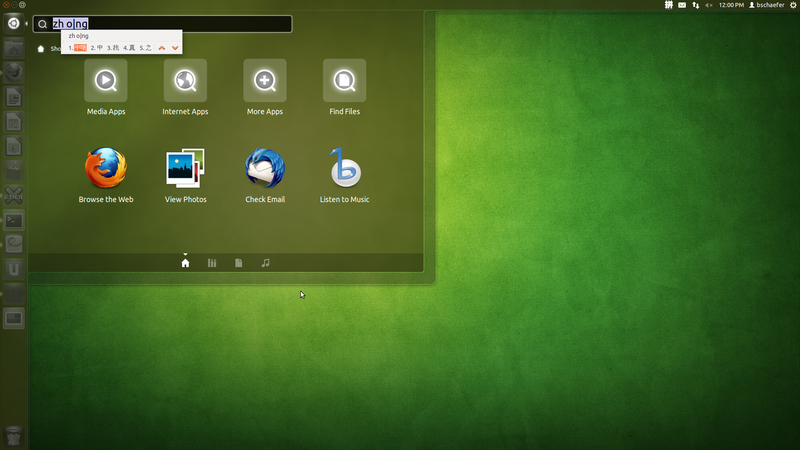 @Kevin Moving the ibus cursor with "zhong" works for me and on 3 other machines I have tested it on. I would try and install unity 4.24.0 from oneiric-proposed and see if that fixes this issue for you. I've enabled the oneiric-proposed to verify this issue. The behavior of backspace, left and down keys of ibus in Unity search is all working now, just like in normal gtk application like gedit. I confirm it works on unity 4.24.0 from oneiric-proposed. Excellent job. In unity 4.22.0-0ubuntu3, the character selection window will not disappear, but the problem is the letters you have input in the dash should be displayed. 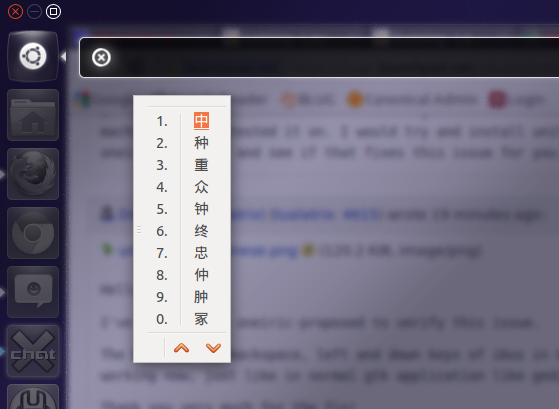 In this case, "zhong", the pinyin letter for "中" should be placed in the dash search bar. * No-change reupload because of broken powerpc build.